Make a bohemian fashion statement with these beautiful Southwest fringe earrings. The geometric design combined with the Native American-style beadwork is sure to be a hit with your boho-tribal spirit. Measuring at 3.25" (8.255cm), these unique seed bead earrings are perfect for most occasions. 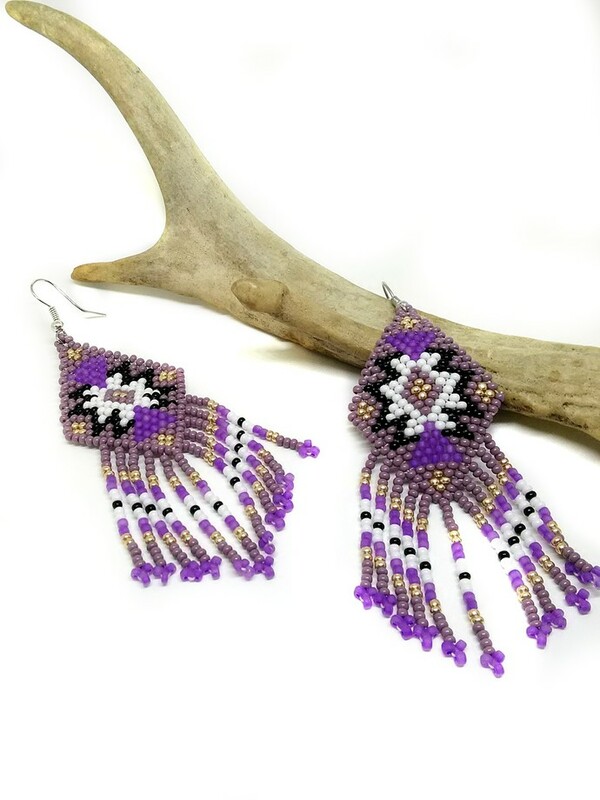 They are hand beaded with size 11/0 seed beads in a 2-tone purple pattern. You know this is the must-have that you have been looking for, so click on the 👉"Add-To-Cart"👈 button now. You won't regret your decision. 🐾 All of our handmade earrings come with rubber ear-nuts to protect your investment from potential loss. 🐾 To see more of my handcrafted beaded jewelry and accessories, please visit the main page of my shop at 👉 https://marketplace.zibbet.com/primitiveriches 👈 for a variety of beaded items to express the free spirit hidden in all of us. P.S. Do you want to save 15% RIGHT NOW? Then copy/paste this link into your browser to grab these awesome savings!